When hair starts to thin, anxiety and lack of self-confidence start to kick in. Hair Loss can be devastating, especially when it happens unexpectedly. PRP Therapy for hair loss in men and women can be ideal for thinning hair and certain types of hair loss. PRP Therapy is offered as an alone standing procedure as well as alongside Neograft Hair Transplantation or Strip Hair Transplantation. Hair Restoration in Savannah was the first comprehensive Hair Clinic in Savannah and also the 1st Neograft Provider in Savannah. In recent years, Dr. Finger our Medical Director decided to offer PRP for Hair Restoration as a nonsurgical solution along with medication and hair care products specifically created for Hair loss in men and women. Let us explain further. What is PRP and how can PRP Therapy help to regrow hair? PRP is Platelet Rich Plasma that is a part of our blood plasma that contains important growth factors that when “activated” can promote tissue regeneration and healing. These same growth factors may help promote hair growth or slow down hair loss. The goal is to stimulate weak hair follicles (and dormant hair follicles) to re-enter the active growth cycle. PRP is derived from the patient’s blood via a simple blood draw. In order to separate the Platelet Rich Plasma from the rest of the blood, we use a machine called a centrifuge, which spins the blood to separate the blood plasma. After the PRP is successfully separated we inject the PRP into the thinning areas of the scalp. Of course, local anesthesia is administered first, so the patient feels virtually no discomfort. No sedation or medication is required, so you can drive yourself to and from the appointment. Our nurses Dallas and Terri are experienced injectors that are familiar with PRP for Skin and Hair Rejuvenation and offer their services within Finger and Associates Plastic Surgery Center in Savannah Ga. PRP Therapy for Hair Loss has helped many of our patients regrow their hair specifically if the hair loss was not related to male pattern baldness. We suggest a regimen of every 9 months to 12- months to achieve and maintain optimal results. Who is the best candidate? Does PRP Therapy for Hair Loss work on everyone? Individual results vary but we found that PRP Therapy for hair loss works best in men and women that are suffering from non-genetic related hair loss. PRP Therapy is also perfect if you just want to improve density and the health of your hair, or if you want to improve your hairline and do not suffer from genetic hair loss. 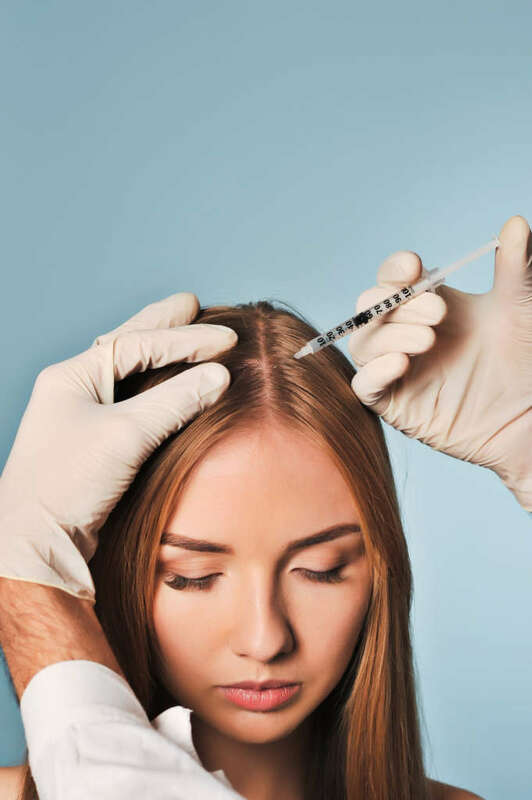 PRP can, however, also be ideal for male and female pattern baldness when combined with hair transplantation such as the NeoGraft method or FUT method. If you just want to maintain your beautiful mane and as a preventive measure, you may want to consider PRP annually, it sure cannot hurt to introduce growth factors and healing agents to stimulate new growth and grow healthy hair. Non-Genetic Hair Loss Causes – PRP Therapy can often reverse this type of hair loss and help to regrow healthy hair. Traction Alopecia – Excessive Pulling from tight hairstyles, Pony-tales, weave, and braids. Hair Loss can be temporary or permanent. Hormonal Hair Loss – Hair Loss that occurs during and after Pregnancy or during and after Menopause. Traumatic Injury – Trauma to the scalp can cause hair loss that can be temporary or permanent. Stress – Excessive stress can cause temporary and even permanent Hair Loss. Over Processed Hair – Damage occurred due to excessive permanent color, heat application or perms. Hair Loss is usually temporary. Men and women who are experiencing hair loss and are looking for a natural nonsurgical solution without side effects of medications can often benefit from PRP hair restoration. However, those who have a medical diagnosis of platelet dysfunction syndrome, cancer, or chronic liver disease should not receive this treatment. The best way to determine if this treatment is right for you is by booking a consultation with Dr. Finger. A full head of healthy hair is a sign of youth, strength, and vigor. For many men, it is key to self-confidence. For women, a full head of luscious hair has been associated with beauty in all cultures throughout the ages. The desire to have a great head of hair does not make you vain or shallow and doing something to stop and reverse hair loss should be attempted by all of us. Dr. Finger and his staff of qualified nurses in Savannah are dedicated to open dialogue, patient education, individual attention, and offer effective hair loss solutions tailored to your unique situation. Together we will determine and pursue the right treatment for you. PRP has been in use in the medical field for several decades and offers promising results for certain types of hair loss in men and women. Hair Restoration Savannah was the first to offer Hair Transplantation, the first to offer Neograft, and the 1st to offer PRP Therapy for hair loss many years ago. Experience counts when it comes to Hair Restoration. Anytime you hear that Dr. Finger is involved, you know that it means advanced methods for anything related to Aesthetics, Skin Care and Hair Restoration. Tylenol is effective if you experiencing any discomfort associated with the injections. This should only be necessary immediately following the treatment. There is no downtime associated with PRP Therapy for Hair Loss. The only recommendation we have is that you either book your appointment in the afternoon or plan on not going back to work immediately after treatment because your hair will be a bit messy after injections and you should not wash your hair for at least 12-18 hours following the injections. Hair Restoration Savannah’s team genuinely cares about your quality of life. We want to see your confidence boost and your hair grow. We want to see you feel comfortable in your own body.